The stock market is gaping higher about 30 min before the open with All index’ approaching the +1% level. TLT is off about 3/4% ,US Dollar is off 1/5% ,metals unchanged and oil up strong. This to me is a very strong premarket configuration. I would not be trading any gap fill trades this morning but would be looking for continuation trades. Ideally with these types of trades you want to look for stocks with strong gaps up that pull back to their VWAP on the 5 or 2 min chart. Or you might even look for pullbacks to the 3% standard Dev in the VWAP, which would be the lower band. I suspect by end of April we get a breakout to new highs in all index’. Hard to fight the tape regardless of how much negative news is out there. And there is plenty. Russia in Venezuela, fallout from Mueller report, Trump’s opponents just will not let the collusion narrative go, increasing fake hate crimes across the U.S. at a geometric pace, Schiff and Nadler like rabid dogs attacking the White House. Now that the Mueller investigation is at an end I suspect a battle like none you have seen before. Trump has already mentioned Treason several times. Typically when he throws something out, big things are coming. I would be surprised if some big name indictments were not in the works very soon. As Bannon put it , it will be outright open warfare between Trump and the people that furthered this hoax. Who wins will most likely decide the course the country takes the next 20 years. Now, regardless of which side you are on in this battle, the best place to be is right in the middle. Things are never as bad as they seem, and never as good as they seem. In addition, like playing Hold-em poker there are a lot of unseen cards out. Many of which we are not privy to. So its essential if your going to make investment decisions based upon the news, that you get fair and accurate analysis. And the one thing everyone should of learned the last few years, the main stream media is not the place you are going to get it. There are some excellent independent investigative journalist that report the news and analysis. They are honest and non ideological driven. These are the sources to go to. Otherwise you will be living in a non reality based world. That will hurt your investing decisions. Myself, I am not burdened by any particular ideological stance. As with handicapping, and stock trading I view politics, objectively and fact based. But, that is a lot to ask from humans that tend to be more emotionally driven. And at any particular point in time, their actions tend to be very self destructive. But that is the human race:) And as a gambler and trader these tendencies create value. If everyone was like Spock, there would be little value in these situations! You cannot change human nature, but you can change how you view things. I have tutored many young poker players over the years on how to approach the world of professional poker. Perhaps one instructive questions was, how do you reconcile people playing so miserable and making money. I explained to him that you have to consider this as “noise”. It means nothing, as in the end these players go dusted. And that is what you have in the markets, a lot of noise, because humans are involved. 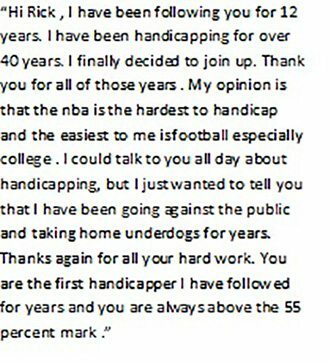 The same is true for sports betting. So to find value you have to be able to separate the noise from what is significant. Not easy to do , as I have said before human nature will sabotage you at every turn from being successful as a gambler. But successful gamblers, regardless of what form they use, recognize this, and adjust. That is one of the keys. In any event, I try to take the randomness out of my investing and go with historically proven trades that have had significant EVs . Very similar to the way I handicap. Now even this is no cakewalk. It requires patience and discipline. Something most humans do not have. Meanwhile we are having a successful NCAA Tournament going something like 7-2 , and MLB is off to a good start + about 3 units for the first 3 days. 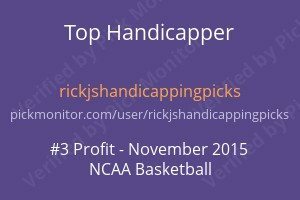 One of the advantages of signing onto handicapping is that you have the option of receiving most of my trades in the market via Viber. A number of people have taken advantage of that. Its a free add on to the handicapping service.